Beads are randomly scattered over a web, and it is up to you to help break the spell. Much of the gameplay revolves around developing solutions-how to make a line of three or more beads of the same color. You better hurry to break the spell over Rainbow Kingdom. 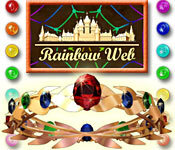 Rainbow Web is rated 4.2 out of 5 by 19. Rated 5 out of 5 by Slangolator from Weird synergy between fantasy puzzle and space shooter that are my favorite Game is so beautiful, and in my stories, Rainbow Kingdom is one of the alien races that has metal ships from space shooter Alien Outbreak 2 Invasion, and one of my favorite races, and about Rainbow Web, game is so beautiful, I love its music and backgrounds, really a good example of alien planet. Rated 5 out of 5 by fredandethel from An evergreen favourite One of the first games I ever bought, and even though I now also have Rainbow Webs 2 and 3, as well as many other games of all sorts, this still stands up well as a beautiful little game to play at bedtime. 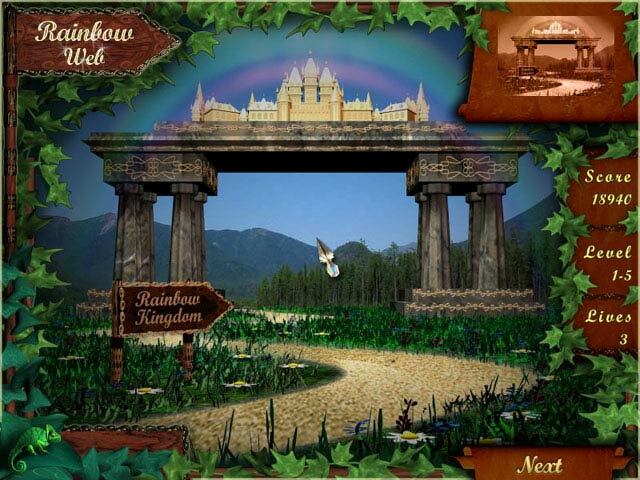 The backgrounds are enchanting, and the way the colour comes back into the map as you achieve each level is charming. Later versions have varied webs and a few minigames, but in some ways this is still my Number One. Rated 5 out of 5 by arnold1049 from TWO GAMES IN ONE This game is an interesting combination of a hybrid Hangman and Match 3. There is a spider looming over a fairy kingdom and your job is to get rid of the spider and restore the rainbows to the kingdom. 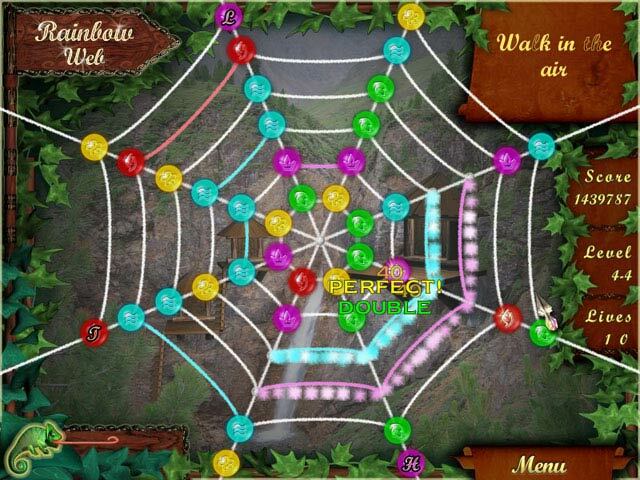 The spider theme is reinforced by the fact that the Match 3 game board is actually a spider web. The semi-hangman part of the game comes into play with a phrase that is shown for each puzzle that must be filled in by removing the relevant letters from the web by the Match 3 process. Once all the letters have been removed, you are done with that puzzle. The game moves you from the valley floor to the top of the mountain. Solving the puzzles for each step adds a graphic to the location scene. The last graphic in each set of puzzles is a rainbow. For instance, in one set of puzzles, you are building a bridge over a river. Each puzzle solution adds something to the bridge; flooring, guard rails, lights, etc. Although the location scenes are beautiful, almost picture perfect, the added graphics are rather dark and dull. Even the rainbows are lack lustre. But that is not enough to detract too much from the fun and challenge of the game. To me, good game play always trumps graphics. As you advance through the locations, the puzzles get harder. The phrases get longer, meaning more letters to find. There are more colors added to the bubbles making it harder to find 3 to match. And sometimes there are parts of the web missing, making some letters extremely isolated. At the beginning of each set of puzzles, you have 3 lives available to lose during play if you play the timed mode, which I did. Each time you fail to complete the puzzle in the available time, you lose a life and have to restart the puzzle. If you lose all your lives, you are taken outside the puzzles and you have to click back through the menus to get back to where you were. Thankfully, you are returned to the puzzle you were playing when you ran out of lives, not to the beginning of all the puzzles for that location. This game makes you think and keeps you on your toes. In order to clear all the letters in the available time frame (which is generous), you must think ahead so that you don't miss any matching plays and that you make moves that set up future plays. It takes a lot of concentration, which is why the mediocre graphics are not that big a deal. There is a non-timed choice of play that would be much less challenging. I enjoyed this game so much that I kept playing it until I got too tired to make good moves or my eyes gave out. And I couldn't wait to get back to it. As a result, I am purchasing the other 2 games in this series, hoping they will be as entertaining and challenging. I hope you have as much fun playing this game as I did. Rated 5 out of 5 by parents2 from love this game I would love it if you could make it available for ipads.I can't stop playing this game .It is my favorite game . Rated 5 out of 5 by grandmagin from Fantastic I have bought all 3 of this series. Played each series at least 3x's each. Never gets old. Hope there is a new one coming out soon. 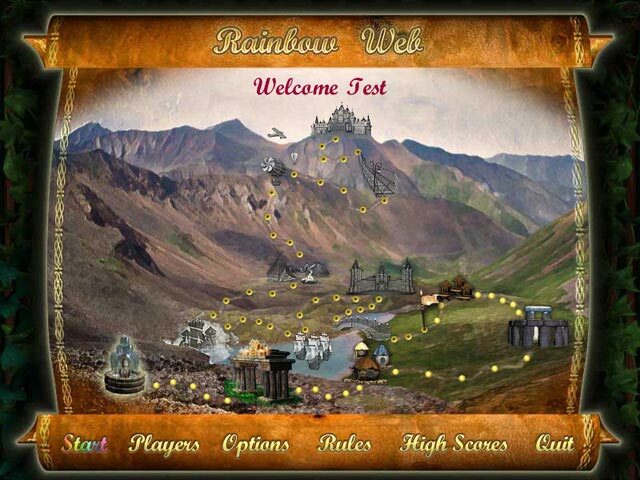 Rated 5 out of 5 by pjsh from Rainbow games I played Rainbow Mystery, Rainbow Web, Rainbow 2, and Rainbow 3. I believe they were the most fun of any I have played lately. I believe they are all sugar cube games. Loved them THANKS! Rated 5 out of 5 by Patriot91 from Challenging Story value is good. Once into it, keeps your interest - you become addicted quickly. Challenge is great - need to be aware where the web lines go. Rated 4 out of 5 by ptbfish from Challenging Match-3 I like the spider web format of the playing board. It is a challenge to look all over the web for possible moves. I like the bright colors of the beads. The graphics are simplistic, and even after you have restored the area, it still felt stony and unwelcoming to me. There is an option to play untimed, which I like. However, on higher levels, if you hesitate too long, in making combinations, it will Time you Out anyway. Despite the above negatives, I go back to this time and again for the mental strategy, and hand and eye coordinating.